This new first edition reader is designed to make it easier for students to locate, read and comprehend historical material. 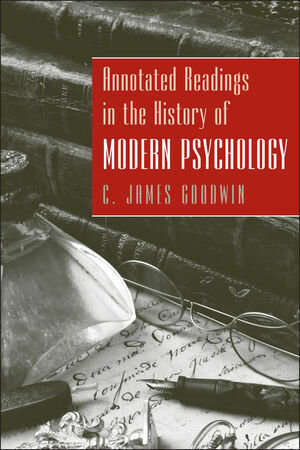 “Annotated Readings in the History of Modern Psychology” includes thirty-six chapters of substantial excerpts and papers from psychology’s history and includes narrative from the author himself. C. James Goodwin’s narrative is woven throughout the passages to give readers information about the original author, describe the importance of the work, put the selection into its historical context, and finally, to explain and elaborate upon some of the more difficult passages. This book could be used as a stand-alone text for a first-year graduate seminar in psychology, or as a supplement to a main text in the undergraduate history of psychology course. Interested in this book of readings? Be sure to take a look at its companion, History of Modern Psychology, 3e at www.wiley.com/college/goodwin. Dr. C. James Goodwin is Professor and Chair of the Psychol­ogy Department at Wheeling Jesuit University. He has published research on human memory processes, the history of psychology, and the teaching of psychology. Dr. Goodwin was named a Fellow of the American Psychological Association, and was awarded the NASA Space Grant Consortium research grant for undergraduate research project. Chapter 4. Paul Broca (1824-1880): The Case of "Tan"